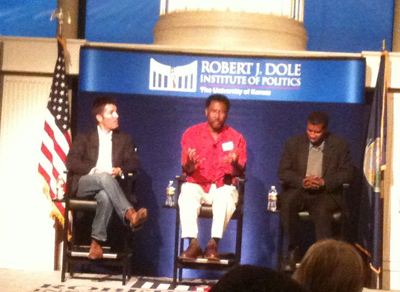 On 31Mar10 I attended my first Pizza and Politics event of the semester, hosted by the Dole Institute of Politics at the University of Kansas. Unfortunately I didn’t have time to stay for the whole thing, and unfortunately it was also an evening of mishaps on my part. To start off with I missed the bus, and the next one wouldn’t have got me there on time. I ended up moving at a fast walk from the Kansas Union, through the Oread neighborhood, past the dorms and over Daisy Hill to get to the Institute. This wouldn’t have been a big deal if I hadn’t been wearing my new Doc Martens, which are still breaking in. More on that later. I got there early enough for the pizza and ended up chatting with one of the evenings panelists, a Mr. Scott Morris. Mr. Morris was part of the relief effort, an emergency contractor who purified drinking water for hospital workers. Bill Lacy and Jonathan Earle, the Director and Associate Director for Programming at the Institute respectively, also came and sat at our table and chatted with us. It was some interesting conversation and they made a friendly effort to engage the students like myself, asking our opinions and making small talk. The presentation itself was a Q&A panel, but the format was such that the questions were submitted by email beforehand and the Institute picked which ones to ask. Aside from Mr. Morris the other two panelists, and I’m probably about to get their names wrong because I don’t have the literature in front of me right now, were Jean-Benito Mercier and Venel Lamarre (names fixed). The two were born Haitians and came to the United States in different ways, one via an organization called the Organization of International Immigration, whose website I couldn’t locate, who came over because of the Aristide regime’s brutality and its legacy. The other gentleman was a “boat person”, picked up by the U.S. Coast Guard and “screened in” at Guantanamo Bay. They spoke a bit about their feelings regarding Haiti’s colonialist past, the roots of the current problems and their reactions to the recent earthquake. Unfortunately I had to leave while they were discussing the earthquake. It was getting toward the time I had to be going, and though I could have stayed a little longer it was here that I noticed that my new Doc Martens, the best shoes in the world once they’re broken in, had worn holes in the skin covering my heels and the backs of my socks were a bloody mess. I have a picture of this tragedy but I don’t think anyone wants to see it. I ended up taking off my shoes outside and walking barefoot from the Dole Institute to the Park&Ride lot. Fortunately I had an extra set of socks and a pair of running shoes in my car. It was an interesting talk and I wish I could have heard the whole thing, but the timing was off for me, and there was the whole “bleeding profusely” thing, so there it is. But I don’t regret making the effort and I don’t know why more students don’t attend these things. I look forward to the next one I can get to.